The Riddler – Can You Solve This Elevator Button Puzzle? In a building’s lobby, some number (N) of people get on an elevator that goes to some number (M) of floors. There may be more people than floors, or more floors than people. Each person is equally likely to choose any floor, independently of one another. When a floor button is pushed, it will light up. What is the expected number of lit buttons when the elevator begins its ascent? Similar to last week, I wanted to simulate the problem before jumping into the math. This’ll also help later to check my work. While certainly not elegant, all I did here was create 10 arrays of 0’s of size 5 to 50 by 5. Array size represents total number of floors (M in context of the problem). From there, I randomly generated an integer from 1 to M, and changed the number at that array index to 1 – representing a pushed button. Repeated the random number generation N times to represent different passenger sizes (all the way until N = M). Finally I re-did this for each array 100 times at a given M/N and then averaged the array sum (representing buttons pushed. Again, not elegant, but it gave me a quick representation of what the data should look like. 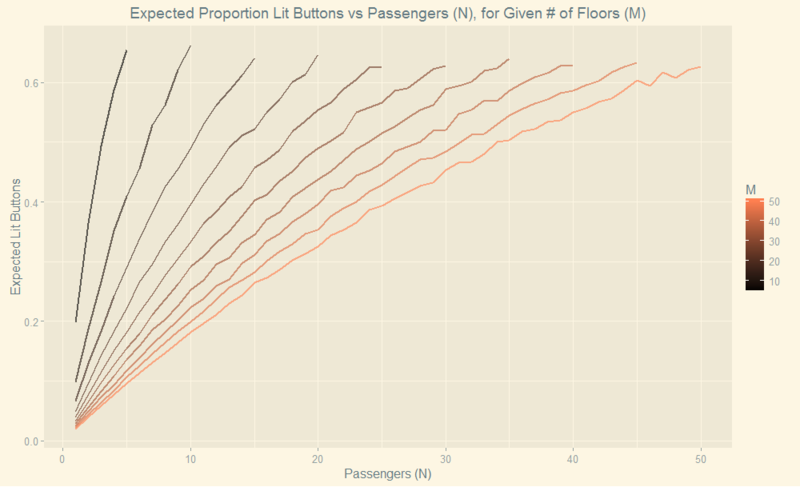 We’ll be using fN to represent expected value of pressed elevator buttons throughout this post. Now that we have an equation, let’s test it against some of the data we generated earlier. So our equation (dashed blue line) fits the simulated data (coral solid line) fairly well. Now we can start trying to simplify our equation. Let’s start by evaluating fN in N = 1:4. Previous PostPrevious The Riddler – How Many Bananas Does It Take To Lead A Camel To Market? Next PostNext The Riddler – Can You Solve The Puzzle Of The Pirate Booty?